The idea is raised in the wake of many mass shootings. The latest mass shooting in America -- this time, at a synagogue in Pittsburgh -- has led to questions about whether or not more armed guards are needed in sensitive locations. The Tree of Life synagogue, where 11 people were fatally shot on Saturday Oct. 27, did not have a security guard on site at the time of the shooting, with the rabbi emeritus telling ABC News that the temple has security for high holidays but not for weekly Shabbat services. President Trump weighed in, suggesting that if there had been armed guards at the synagogue, it could have helped reduce the carnage. "If they had protection inside, the results would have been far better," Trump said hours after the shooting Saturday. "This is a dispute that will always exist, I suspect, but if they had some kind of a protection inside the temple, maybe this would have been a very different situation. They didn’t and [the shooter] was unfortunately able to do things he shouldn’t have been able to do." LaPierre famously made those remark after the Sandy Hook school shooting in 2012 that killed 20 children and six school staff, and reiterated it in February after the shooting at a Parkland, Florida, high school that left 17 dead. Research has shown, however, that the maxim isn’t always accurate. "It’s a good slogan,” said Liza Gold, a clinical professor of psychiatry at Georgetown University’s School of medicine who examines the nexus between mental illness and gun violence. "I have yet to see the evidence base for that claim,” she told ABC News in the wake of the Parkland high school shooting earlier this year. 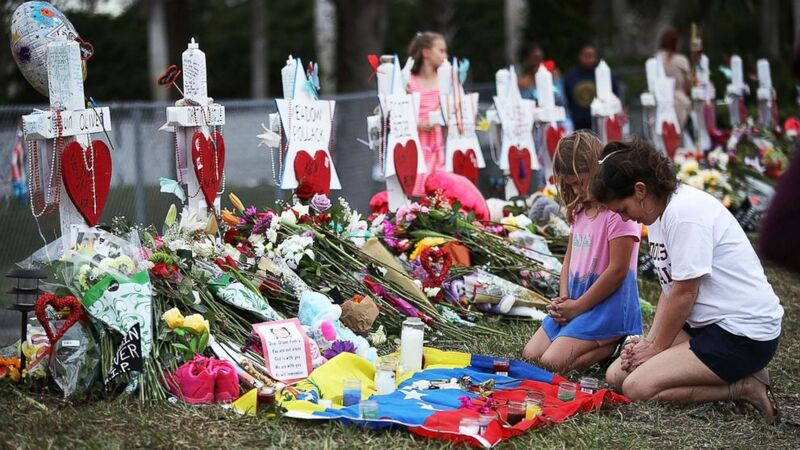 (Joe Raedle/Getty Images) People visit a makeshift memorial setup in front of Marjory Stoneman Douglas High School, Feb. 19, 2018, in Parkland, Florida. John Donohue, a law professor at Stanford University, was a co-author of a National Bureau of Economic Research study that examined how gun violence coincides with the ability for individuals to carry concealed weapons, known as Right To Carry (RTC) laws. The NBER study discredited the idea of the “good guy with a gun” as a possible solution to gun violence. Donohue told ABC News that the research “concluded that allowing citizens to carry handguns seems to increase violent crime 13 to 15 percent by the 10th year” of the laws being enacted in the state. Another takeaway from the NBER report is that the presence of the gun could turn a would-be good guy into an intentional or unintentional bad guy. Donohue and his co-authors cited the infamous 2012 case of George Zimmerman, a neighborhood watch volunteer who got into a deadly confrontation with teenager Trayvon Martin. “Presumably, George Zimmerman would not have hassled Trayvon Martin if Zimmerman had not had a gun, so the gun encouraged a hostile confrontation, regardless of who ultimately becomes violent,” the report stated. “The presence of the gun actually stimulates more provocative action and ends up getting people killed,” he said. A 1997 study co-authored by economist John Lott argued that the greater presence of concealed weapons led to a decrease in crime. The study examined data from 1977 to 1992. While Lott continues to defend the findings and writes about similar research in more recent pieces, it was viewed by many in the field as being debunked by a 2004 National Academies National Research Council report. That report, however, did not make a causal relationship between concealed weapons and crime. 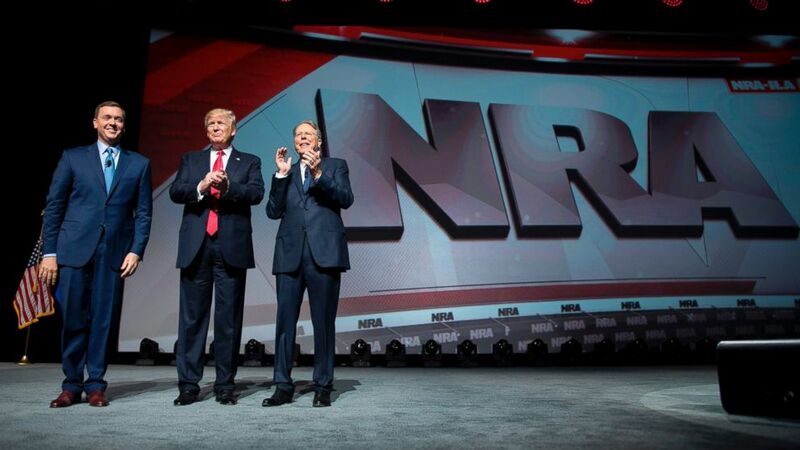 (Jim Watson/AFP/Getty Images) Donald Trump stands with National Rifle Association (NRA) President Wayne LaPierre, right, and NRA-ILA Executive Director Chris Cox during the NRA Leadership Forum in Atlanta, April 28, 2017. Part of the reason that there is a noticeable dearth of studies relating to gun violence, experts say, is because of active efforts to prevent such research from occurring. Gold pointed to the Dickey Amendment as the clearest example of such obstruction. The federal government in 1996 banned the use of any funds from the Centers for Disease Control and Prevention from being "used to advocate or promote gun control." The NRA was widely reported to have lobbied for the inclusion of the amendment, written by then-Rep. Jay Dickey, R-Ark., in that year's omnibus spending bill. "The NRA is and has been deathly afraid of what firearms research would show about access to firearms and gun violence that they have engaged in multiple activities to prevent evidence-based firearm research and policy that would hurt their constituency which I would argue are not the law-abiding gun owners in the United States," Gold said. Donohue echoed Gold's sentiments, saying that the NRA "does everything it can to suppress information" about gun violence. The FBI has also compiled some of its own numbers breaking down what role "good guys" have played in active shooter incidents. In a 2014 report, the FBI examined 160 active shooter incidents that took place between 2000 and 2013. The report found that in five of those incidents, armed individuals who were not members of law enforcement exchanged gunfire with the shooter, leading to either the shooter being killed, wounded or taking his own life. By contrast, 21 of the 160 incidents ended after unarmed citizens “safely and successfully restrained the shooter,” the report stated. “Most of the time, if you’re talking about a civilian stopping a mass shooter, it’s the unarmed guy without the gun because they're right there,” Donohue said. There is a growing number of mass shooting incidents that occurred after the release of the FBI’s 2014 report where a so-called good guy with a gun was on the scene but did not stop the shooting or shooter. One high-profile recent example is the armed school resource officer at Marjory Stoneman Douglas High School who did not enter the building or engage the shooter. Fourteen students and three adult staffers were gunned down. Five people were killed at the January 2017 shooting in the baggage claim portion of the Fort Lauderdale airport, where there are regularly armed police officers. Las Vegas casinos are known to have regularly armed police officers and there were off-duty law enforcement officers at the Route 91 Harvest Festival but the shooter who fired at the concertgoers was able to fire shots for roughly 10 minutes before the shooter’s room was breached by police officers. In November 2017, a so-called "good guy" did respond to the shooting that unfolded at a church in Sutherland Springs, Texas, but not until after the suspect had left the scene and already killed 26 people inside the church. 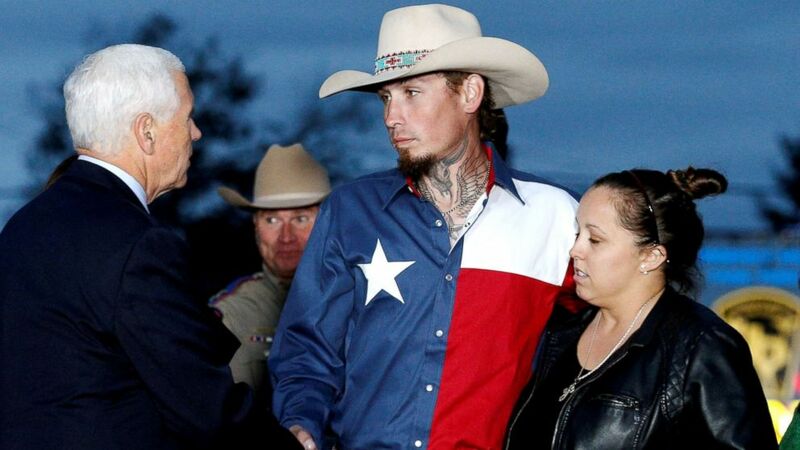 (Jonathan Bachman/Reuters) Vice President Mike Pence shakes hands with Johnnie Langendorff, who was one of the heroes that chased the assailant, near the site of the shooting at the First Baptist Church of Sutherland Springs in Sutherland Springs, Texas, Nov. 8, 2017. “It’s not very often that somebody with a gun who’s a private citizen plays a useful role in ending these mass shooting events,” Donohue said. David Chipman, who served as a special agent for the Bureau of Alcohol Tobacco and Firearms for 25 years before becoming a senior policy adviser at gun violence prevention advocacy group Giffords, said there is insufficient training for many armed civilians. “I was a good guy with a gun. I was a member of ATF's version of SWAT and I know what it takes, and the training that is required to perform during a critical incident when rounds are being fired at you,” Chipman told ABC News. “I can imagine scenarios wherein trained hands, a gun could be used in self-defense of oneself. It’s a whole ‘nother thing to imagine [how] a gun in untrained hands could somehow result in winning a gun battle, and my belief is that this ‘good guy with a gun’ messaging really is a sales technique to encourage people to believe that their capabilities with a gun are well beyond what they would actually be like in scenario like Parkland,” Chipman said, referring to the recent Florida shooting. Editor’s note: Liza Gold is a clinical professor of psychiatry at Georgetown University’s School of medicine. An earlier version of this story misstated her title as professor of psychology.